Opera VPN app for iOS launched. 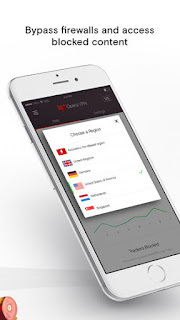 Opera today announce the launch of Opera VPN, a free iOS app that allows you to change your virtual location by connecting you to one of five regions and borrowing an IP address from that area. You can choose among the U.S., Canada, Germany, Singapore and The Netherlands. The Opera VPN app also removes ad-tracking cookies that follow you around the web. The app creates a secure tunnel between you and SurfEasy's VPN servers, making it more difficult for sites to track you. Opera VPN app allows you to change your virtual location.